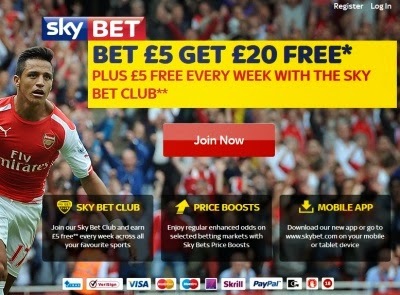 The TV giant Sky offer to the UK residents the opportunity to bet on their online sportbook and get the generous offer: Bet £5 Get £20 Free Bet. Skybet is an amazing place to place bet and to play casino and poker online. This is one of the fastest growing betting sites and their main focus is to offer innovative products to their players. You can open a new account: HERE. To make sure that you will get the bonus best to check out their T&C first. For example you should be using Skrill or Neteller for your qualifying deposit. Your bet must be £5 or more on any sports market at odds of evens or above.